Seven of Drum Corps International's top World Class corps came together July 11 in Warrensburg, Mo. to begin the 2013 Tour of Champions (TOC) event series. After stops in Illinois, Texas, Tennessee, and North Carolina, just one more lies ahead before the final event in Buffalo, N.Y., where a Series Champion will be awarded the first-ever TOC Cup. All seven TOC series events include special pre-show and intermission entertainment, an all-corps finale performance, and an interactive audience experience highlighted by small-group performances throughout the event venue and meet-and-greets between corps members and fans. 2013, the third year of this exciting, nontraditional event format, uses a new cumulative scoring system, which aggregates the scores of all seven events in order to determine the TOC Champion. Determining each corps' average score in the first six TOC events, then adding each corps' respective average to its score from Buffalo, N.Y. yields the final cumulative score. Current averaged results as of July 27 in Charlotte, N.C.: 1. Carolina Crown (73.95) 2. Blue Devils (73.80) 3. The Cadets (73.45) 4. Santa Clara Vanguard (72.07) 5. Phantom Regiment (70.48) 6. Bluecoats (69.43) 7. The Cavaliers (68.18) These average scores will change as the corps participate in the Allentown, Pa. TOC event Sunday, Aug. 4, and final scores in Buffalo will play a large role in determining the 2013 TOC Cup's recipient. Learn more about the TOC event series scoring system. Don't miss out on the TOC excitement! Tickets are still on sale for the last two events in the series with great seats still available. Sunday, Aug. 4 – Allentown, PA Tour of Champions – Allentown J. Birney Crum Stadium. Monday, Aug. 5 – Buffalo, NY Tour of Champions – Drums Along the Waterfront Ralph Wilson Stadium Buy tickets to this event. If you can't make it to Buffalo, the complete event will be webcast live on the DCI Fan Network. 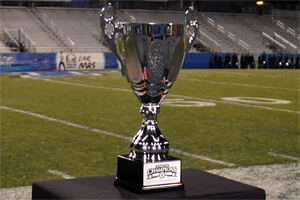 Learn more about watching the Tour of Champions event in Buffalo on the DCI Fan Network.